It is said “What I am looking for is what is looking”. Hmmm….. So here I am on the Sunshine Coast, in an extremely short – short term rental, contemplating my next move with no obvious options in sight. At this moment my mind drifts to the image of a rollercoaster. Fill time, days slip, emotions ride…ride the rollercoaster. There is a part of me that is more clearly understanding that this is the last vestige of discontent. My days have been filled with a little exploring, a little painting and a whole lot of thinking. Quietude has its way of bringing clarity and insanity all at the same time. The clarity is supported by thoughts of family and friendship and the living of life itself and the insanity is brought about by fear…fear of the unknown basically. 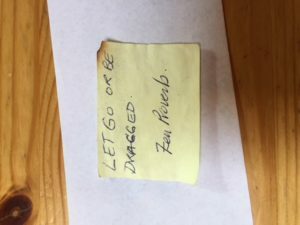 I have this little post – it note that I wrote on several years back. It has been with me quite a while now. 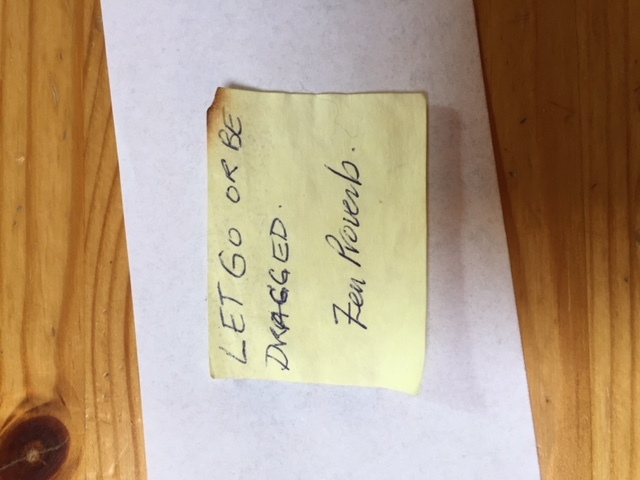 I used to keep this little note in my cupboard and periodically it would detach itself from the door and float down to remind me…. It looks as though at some point it floated onto the stove top as the corner of the paper has a little burn. Wonder what that was trying to tell me :)) Anyway, this little note reminds me to let go of the fear and try my best to listen to my heart and not my mind chattering its limits. I am one who has learned very well how to busy myself with life to reap the distractions it offers, so as not to have to deal with the rollercoaster of quietude. I have come to realise that painting is one of my favourite distractions. Perhaps that is why I have clung to it so fiercely. I miss my studio so much, all of that wonderful studio bling but what my precious time of non doing has shown me is that when my new studio shows itself, it will be a glorious space of imagination and creativity and not one of escape from myself. Chalk one up for “what I am looking for is what is looking”.